Submitted by admin4 on 26 March 2010 – 7:47pm. New Delhi : “Islam and Christianity are alien” to India and, therefore, the Bharatiya Janata Party (BJP) feels people from the minority groups, even if their socio-economic condition is low, should not be given the privilege of quota in jobs, legislative bodies and education, a party official said Friday. At a press conference here, BJP’s newly-appointed spokesperson Ramnath Kovind called for scrapping of the Ranganath Misra commission report that recommends 15 percent quota in government jobs for socially and economically backward sections among religious and linguistic minorities in India. He said that “it is very well known” that convert Dalit Christians and Muslims get better education in convent schools. “The educational level of Scheduled Caste children remains much lower than that of convert Dalits and Muslims. The children of converts will grab major share of reservation in government jobs. They would become eligible to contest elections on seats reserved for Scheduled Castes. This would encourage conversion and fatally destroy the fabric of Indian society,” he said. “The Misra commission report should be scrapped because (its recommendations) will jeopardise the interests of Scheduled Castes,” he said. Of India’s 1.2 billion population, Muslims form the largest minority at close to 14 percent, followed by Christians at 2.3 percent, Sikhs at 1.9 percent, Buddhists at 0.8 percent, Jains at 0.4 percent and others including Parsis at 0.6 percent. “Within the recommended 15 percent earmarked seats in institutions shall be 10 percent for the Muslims and the remaining 5 percent for the other minorities,” the report had suggested. A Kerala college student, who had disputed the famous black hole theory of noted scientist Stephen Hawking, has become part of the Large Hadron Collider (LHC) experiment. The LHC, a gigantic instrument placed near Geneva, is studying the impact of particle collision. C.V. Midhun, a second semester B.Sc. Physics student of the Majlis Arts and Science College at Puramannur in Valanchery, is taking part in the LHC experiment online from his home at Naduvattom. Midhun was given online access to the experiment by the European Organisation for Nuclear Research (CERN), the world’s largest particle physics laboratory, following the “relativity theories” put forth by him. He had claimed that there would be no black hole when protons collide. He made his point by measuring the energy generated by the cosmic rays coming out of particle collision and comparing it with that of the cosmic rays from the sun. Midhun, son of Vallabhan Namboothiri, a temple priest, and Sreedevi, a teacher, first sent his theory to the Indian Institute of Sciences (IISc) in Bangalore. The IISc scientists, realising the significance of his theories, directed him to the CERN. Impressed by his theories, the CERN authorities inducted him into the LHC experiment. They made him part of the ATLAS collaboration, one of the six particle detector experiments of the LHC. On Saturday, the Malappuram District Panchayat felicitated Midhun at a function. Union Minister of State for Railways E. Ahamed presented him with a memento and he was congratulated by a host of political leaders and people’s representatives. A German fashion label is out to tell the world that Islam isn’t just compatible with Western values of tolerance and free expression — it can be hip, too. The project was born in 2006 as Muslims protested across Europe against Danish cartoons of the Prophet Muhammad. Designer Melih Kesmen became fed up with the anti-Muslim stereotypes that sprang up over the protests as well as the protesters’ immature efforts. So Mr. Kesmen, a practicing Muslim born and raised in Germany to Turkish parents, decided to express his feelings through fashion. “I first created a sweater just for myself with the slogan ‘I love my Prophet’ to take a stand as a peace-loving, tolerant Muslim,” said the 34-year-old designer, sporting designer glasses and a black goatee. The reaction was huge: People kept stopping him in the street to ask where he had found the top. Mr. Kesmen quickly realized he’d found a market gap. Together with his wife, Yeliz, he set out to create Style Islam, a brand of hip, casual clothing with Islamic-themed sayings as its focus. More than three years on, Style Islam offers 35 different motifs that playfully merge Islam and pop culture. Besides clothing, their collection also features bags and posters. “Women love buying rompers with the writing ‘Mini Muslim’ across their chest,” said Mrs. Kesmen, 30, who wears a brown hijab, or headscarf, and silver nose stud. Why do so many Evangelical Christians expend so much effort disparaging Islam and Muslims? I am rereading From Jesus to Christ: The Origins of the New Testament Images of Jesus by Paula Fredriksen, Professor of the Appreciation of Scripture at Boston University. Unwittingly she provides a possible answer to this question by describing the persistent attraction of Judaism for Gentiles in the early centuries after Christ. Curiously, the early Church fathers most often expended their energies criticising Judaism (see example below), rather than the idolatry of the Roman Empire, or its brutal abuse of power. Fredriksen identifies the reason why: Judaism represented an attractive alternative to the new religion of Pauline Christianity. Similarly, for many thoughtful people in the West, Islam represents an attractive alternative to the illogicalities of Trinitarianism. Evangelicalism’s prime directive therefore is to eliminate its principal rival: Islam. An ironic goal, as followers of the latter religion believe in Jesus the Christ and the prophets sent to Israel as well. Judaism was more than a standard challenge to Christian identity; it was also a competitor for Gentile adherents. During this period [1st and 2nd centuries] and long after, Gentiles continued to attach themselves to the synagogue for the same reasons that had always drawn them before: Judaism’s monotheism, its antiquity, its articulated ethics and strong community, its claims to revelation, and its prestigious sacred text. The rise of the Gentile Christianity is itself the best evidence of Judaism’s appeal: the church, though it repudiated the synagogue, also used it socially and religiously as a model. Christianity thereby offered to Gentiles fewer of Judaism’s disadvantages (circumcision for adult males; association with a nationality implicated, after the bloody revolts of 66, 117, and 132, in anti-Roman activity) but many of the same attractions (strong community, revealed ethical guidelines, and the scriptures themselves – already available, thanks to the Hellenistic synagogue, in Greek). But the churches competed for these Gentiles against a religious community both better established and more broadly recognised. Here Christianity again offers the best evidence of Judaism’s abiding appeal. Christian invective, from the gospels through the writings of the second-century fathers and beyond, most often and most energetically targeted Judaism. Why? If its goal were to wrest Gentiles from the errors of paganism, one would expect more attention to polemics against idolatry; if its goal were to condemn the unethical exercise of power, one would expect stronger criticism of the empire, which after all had executed the Saviour and continued, sporadically, to persecute his followers. Why expend so much effort disparaging a community ostensibly engaged in compatible activity, turning Gentiles from idolatry to the worship of the God revealed in scripture? Because, to those Gentiles drawn to such religions and such communities, Judaism represented an attractive alternative to the church. It may be illuminating by way of example to cite recent statements of what I call the new anti-semitism: disparaging rhetoric now emanating from evangelical circles about Islam. Notice how it parallels the toxic anti-Jewish rhetoric that was virtually ubiquitous in the early church. Nabeel Qureshi is an outspoken member of the resurgent Christian anti-Islam movement in the United States. On the Answering Muslim website he recently wrote: “Muslim terrorists are just that, the embodiment of Islam” (blog entry February 2010). As is well documented, virulent anti-Jewish rhetoric has been the besetting sin of Christianity. Here are two representative examples from prominent and hugely influential Christians of the past. Translated by Martin H. Bertram, On The Jews and Their Lies, Luther’s Works, Volume 47; Philadelphia: Fortress Press, 1971. The question remains therefore: how can Muslims constructively respond to this resurgent ‘new anti-semitism’? Firstly, there is the important Qur’anic principle of responding with what is better, and not being dragged into the abusive slanging matches so often seen on the Internet (and elsewhere). Secondly, despite the apparent predominance of evangelicalism in the world there are important points of discussion that can be had with committed Christians who do want to engage in respectful dialogue. These points might include the fact that all religious traditions emphasise God’s love for the poor and outcast; the importance of understanding the Islamic belief that God’s love makes redemption available throughout history, not only during a defined period two thousand years ago; the urgent need to deconstruct the media stereotype often imposed upon Muslims (as on Jews in the past) as being violent and legalistic. Our contribution as Muslims to this ongoing discussion is that we worship a God who while being the source of justice, is nevertheless absolutely free in His love and mercy to forgive whom He chooses. To Christians we say that this appears to us considerably less legalistic than a theology that considers mankind’s sinfulness a debt that He must collect. Finally, we ask evangelicals to acknowledge the ‘Judaeophobia’ to be found in the New Testament itself (see for example John 8: 44,47), and recognise how it has generated hatred towards the Jews throughout nearly two thousand years of Christian history. This acknowledgement (belatedly made by many non-evangelical Christian theologians) might lead to a greater evangelical sensitivity to how the early Christians demonised Jews and the Jewish faith, and lead, inshallah, to a much needed reappraisal of the current disparagement of Muslims and Islam. 60 Islamic ways to get and keep your wife’s love forever- GUARANTEED! 2. When you go home say ‘Assalmualikum.’ (Greetings) It kicks the shaitaan out of your home! 3. Prophet (Sallal lahu alaihy Wasallam) described the wife as a fragile vessel and said to take care of this vessel that’s fragile. Remember that there is goodness in this vessel so treat it gently. 4. When you advise her, do so in privacy, in a peaceful environment. NOT IN PUBLIC as it’s a type of slandering. 6. Move and let her have your seat. It will warm her heart. 7. AVIOD ANGER. HOW? Keep your wudu at all times. Prophet Sallal lahu alaihy Wasallam said if you are angry, sit down, if you’re sitting, then lie down. Follow the sunnah! 8. Look good and smell great for your wife. IT keeps the LOVE! 9. Don’t be rigid. It will break you. Prophet Mohammed – Sallal lahu Aleihi Wasallam (SAW means “May the blessings and the peace of Allah be upon him” (Muhammad).) said ‘I am the best amongst you and I am the best to my wife’. Being rigid and harsh will not bring you close to Allah and neither does it make you more of a man. 11. YES to flattering NO to arguing. Arguing is like poison in a marriage. Al zawai said ‘When Allah (swt) wants evil for people He will leave them to argue amongst themselves’. 12. Prophet (Sallal lahu alaihy Wasallam) said to call your wives with the best name, any name she loves to hear. Prophet Mohammed (Sallal lahu alaihy Wasallam) called Aisha ‘ya Aish’ as an endearment. 13. Give her a pleasant surprise. I.e. if she loves watermelon, bring her one out of the blue. It will grow the love in her heart. 14. Preserve your tongue! Prophet (Sallal lahu alaihy Wasallam) said the tongue will throw people in the hell fire so watch what you say and how you say it! 15. All of us have shortcoming. Accept her shortcoming and Allah (swt) will put barakh in your marriage. 16. TELL her you appreciate her. SHOW her you appreciate her. 17. Encourage her to keep good relation with her relative, her mum and dad etc. 18. Speak with her with a topic of HER interest. 19. In front of her relative praise her. Confirm/ realize that she is wonderful, and that she is a good person in front of her family. 20. Give each other gifts. You will love each other more. Prophet (Sallal lahu alaihy Wasallam) said gifts increases love. 21. Get rid of the routine once in a while, surprise her with something, it will get rid of the rust and polish it! 22. Husnul zaan- We have a demand from Allah (swt) that we have to think good of people. Think good of your spouse. 23. Ignore some of her mistakes- pretend you did not see/hear some of her small mistakes. It was a practise of Ali (RA). It’s like putting a hole in your memory. Don’t save it in your memory! 24. Increase the drops of patience, especially when she is pregnant or when she is on her monthly period. 25. Expect and respect her jealousy. Even Aisha (ra) used to get jealous. 26. Be humble. If your profession is good, respect that she is looking after your children, she is much more than you, she is the leader at home, her strength is your strength, and her success is your successes. 27. Don’t put your friends above your wife. 28. Help your wife at home. Prophet (Sallal lahu alaihy Wasallam) used to help his wives at home and he was the best of creation. He used to sew his own clothes. 29. Help her respect your parents, you can’t force her to love them, but she can be helped to gradually love them. 30. Show your wife she is the ideal wife. 31. Remember your wife in your duaas. It will increase the love and protect it. 32. Leave the past. It brings nothing but pain and grief. It’s not your business. The past is for Allah (swt). 34. Shaitaan is your enemy, not your wife. Sometime when husband and wife are talking a fight breaks out, then shaitaan is present there as a third person so he is the real enemy. It is not enough to hate the shaitaan, but you have to see him as an enemy as Allah has commanded. Shaitaan loves divorce. HE comes everyday and sits office and asks the devils what they have done, some say i have made a person steal, or i have made someone drink etc. And one devil will say i have made a man divorce his wife, and he is crowned as the one who has done the best job. 35. Take the food and put it in her mouth. Prophet (Sallal lahu alaihy Wasallam) taught us this. It’s a blessing. The food doesn’t just go to her stomach, but straight to her heart. It increases the love and mercy between you. 36. Protect your wife from the evil of the shaitaan and mankind. She is like a precious pearl that needs protecting from the envy of human devils and shitaan. 37. Show her your smile. Smile at your wife. IT’S A CHARITY. 38. Small problems/ challenges can become a big problem. Or if there is small thing she didn’t like and you keep repeating them anyway, it will create a wall between you. Don’t ignore them as it can become big. 39. Avoid being harsh hearted and moody. Allah said of prophet (saw) ‘if you were harsh hearted they (the companions) would have left you.’ It confirms prophet (Sallal lahu alaihy Wasallam) was not harsh hearted, so GET RID OF IT. 40. Respect her thinking. It’s strength for you. Show you like her thoughts and suggestions. 41. Help her to achieve her potential and help her to dig and find success within as her success is your success. 42. Respect the intimate relationship and its boundaries. Prophet (Sallal lahu alaihy Wasallam) said she is like a fragile vessel and she needs to be treated tenderly. Sometime she may not be feeling well; you must respect and appreciate that feeling. 43. Help her to take care of the children. Some men think it makes them appear less of a man but in fact it makes you appear a bigger man and more respected, especially in the sight of Allah (swt). 44. Use the gifts of the tongue and sweet talk her. Tell her she looks great, be an artist. Pick and choose gifts of the tongue. 45. Sit down and eat with her and share food with her. 46. Let her know you are travelling. Don’t tell her out of the blue as it’s against Islam. Tell her the date/ time of when you are coming back also. 47. Don’t leave the house as soon as trouble brews. 48. The house has privacy and secrecy. Once you take this privacy and secrecy to your friends and family you are in danger of putting a serious hole in your marriage. This secrecy stays home. Islam is against leaving them out like a garage sale for anyone to come and pick and choose. 49. Encourage each other for ibadah, i.e. plan a trip for hajj or umrah together. It increases and strengthens the love when you help each other perform a good deeds together i.e, do tahajuud together,or go to a dars together etc. 50. Know her rights, not only written in paper but engraved in your heart and engraved in your conscious. 51. Allah( swt) said ‘live with your wives in kindness.’ Treat them with kindness and goodness. It means in happy times and in sadness treat her with goodness and fairness. 52. Prophet (Sallal lahu alaihy Wasallam) showed that at the time of intimacy. Don’t jump on your wife like an animal! 53. When you have a dispute with your wife don’t tell everyone. It’s like leaving your wounds open to germs so be careful who you share your problems and disputes with. 54. Show your wife you really care for her health. Good health of your wife is your good health. To care for her health shows her that you love her. 55. Don’t think you are always right. No matter how good you are you have shortcomings. You are not perfect as the only one who was perfect in character was prophet (Sallal lahu alaihy Wasallam). Get rid of this disease. 56. Share your problems, your happiness, and your sadness with her. 57. Have mercy on her weakness. Have mercy when she is weak or strong as she is the fragile vessel. Prophet (Sallal lahu alaihy Wasallam) said that your wife is a trust in your hand. 58. Remember you are her strength, someone to lean on in times of hardship. 59. Accept her as she is. Prophet (Sallal lahu alaihy Wasallam) said that women are created from the rib which is bent. If you try to straighten her you will break her (divorce). Prophet (Sallal lahu alaihy Wasallam) said that you may dislike one habit in her but you will like another manner in her so accept her as she is. 60. Have good intention for your wife all the time, Allah monitors your intention and your heart at all times. Allah (s.w.t) said Among His Signs is that He created for you wives from among yourselves, that you may find repose in them, and He has put between you affection and mercy. Verily, in that are indeed signs for a people who reflect. (AP) JERUSALEM (AP) – Israeli police are improperly arresting Palestinian boys in nighttime raids in Jerusalem that involve assault rifle wielding security forces handcuffing minors and interrogating them without lawyers or parents, an Israeli rights group charged Tuesday. Most of the youths were accused of hurling rocks at Jewish settlers and damaging their property in the east Jerusalem neighborhood of Silwan, where tensions are high between settlers and Palestinian residents. Some of them have since been charged. Police say the arrests were legal, and a matter of law and order. “They are using military-style night raids to extract children as young as 12,” said Sarit Michaeli of rights group B’tselem, which says the raids are an inappropriate method to detain children. They also argue the raids defy Israeli law, which demands children be accompanied by guardians while being arrested. In affidavits to B’tselem, six boys aged between 12 and 14 years old described arrest raids involving around a dozen heavily armed military police surrounding their homes, handcuffing them and leading them to cells where they were slapped, kicked and told by interrogators to confess if they wanted to go home. Some 40 boys have been taken into custody over the past year, and around half were 14 or younger, B’tselem said. One of the boys, Ahmad Saim, 12, was arrested at around 3 a.m. on Jan. 10. “I was made to kneel and face the wall and every time I moved a man … slapped me across the neck,” said Saim in an affidavit. Saim said an interrogator pushed him into the wall, causing a nose bleed. Police spokesman Mickey Rosenfeld said the police acted within the law. “We will continue to operate despite the age of the suspects, once we have information on crimes,” Rosenfeld said. In the West Bank, where Israeli military law applies, a 13-year-old boy was held for nine days in detention with adults because his impoverished father could not afford to pay $500 bail, the Haaretz daily reported. An Uzbek citizen managed to protect his good name and the right to wear a beard, considered by local officials an attribute of extremists, the Uznews website said. Officials requested the 25-year-old Muslim, a resident of Uzbekistan’s second largest city of Samarkand, to provide a document proving his right to wear a beard when the man identified as Abdukhamid was applying for a new passport to replace his expired one. He then turned to an imam of a local mosque, who in turn refused to give him official permission to wear a beard, fearing unwanted attention and pressure. “I myself do not wear a beard so as to avoid being included in the list of bearded men,” the imam reportedly told Abdukhamid, adding authorities were “afraid” of bearded men, whom they considered members of local extremist organizations. To clarify the issue, the man was to talk to a lawyer, who confirmed that the right to wear a beard was guaranteed by the Uzbek Constitution and that the authorities’ request for a special permit proving this right ran counter to the law. According to Uznews, Abdukhamid did not abandon his efforts to protect his legal rights despite the lawyer’s advice of receiving the document or shaving off his beard. Eventually, he managed to meet the top regional imam, who gave him the long-awaited document that stated the man was not an extremist and could wear a beard. The news service said the officials, who illegally ordered the 25-year-old to get the document, were surprised when he provided it, saying it was a rare case when a bearded man managed to meet such a requirement. Human rights violations are frequent in Uzbekistan, as well as in other Central Asian states. But where exactly has the ground shifted? The places of focus–and much of the furor against Bush’s terror politics over the past few years–are outside our nation’s borders, in distant lands and faraway prisons. The problem of torture and other human rights violations in America’s “war on terror” has been framed as a problem that happens largely beyond our shores. The underlying assumption is that if Guantánamo detainees were to be tried on United States soil and in federal courts (as many groups demand), such egregious abuses would not occur. But Guantánamo is not simply an aberration; its closure will not return America to the rule of law or to its former standing among nations. Guantánamo is a particular way of seeing the Constitution, of constructing the landscape as a murky terrain of lurking enemies where the courts become part of the bulwark against such dangers, where rights have limits and where international standards must be weighed against national security. It is an outgrowth of a “war on terror” with historical precedents that took root under Clinton (in legislation like the 1996 Antiterrorism and Effective Death Penalty Act), spread like kudzu under Bush and infiltrated the fabric of the justice system. It is a pre-emptive strategy where stopping terrorism has come to mean detaining and prosecuting people who may not have committed any actual act of terrorism but whose religious beliefs and political associations ostensibly reveal an intention to do so. T he day after President Obama signed the three executive orders, I sat in a courtroom for a hearing in the case of Syed Fahad Hashmi. Hashmi is a 29-year-old Muslim American citizen being held in solitary confinement at the federal Metropolitan Correctional Center (MCC) in Lower Manhattan. He is charged with two counts of providing and conspiring to provide material support and two counts of making and conspiring to make a contribution of goods or services to Al Qaeda. If convicted, Hashmi faces seventy years in prison. He is also a former student of mine at Brooklyn College who graduated in 2003 and received his master’s degree in international relations at London Metropolitan University in 2005. Hashmi was apprehended in Britain on June 6, 2006, on a US warrant; his arrest was featured as the top story on the CBS and NBC nightly news programs, which used graphics blaring Terror Trail and Web of Terror. Held for eleven months without incident at Belmarsh Prison, he became the first US citizen to be extradited by Britain under new policies relaxing the standard for extradition in terrorism cases. The Justice Department claims that the “centerpiece” of its case against Hashmi is the testimony of Junaid Babar. According to the government, in the beginning of 2004, Babar, also a United States citizen, stayed with Hashmi at his London apartment for two weeks. In his luggage, the government alleges, Babar had raincoats, ponchos and waterproof socks, which Babar later delivered to the third-ranking member of Al Qaeda in South Waziristan, Pakistan. It was alleged that Hashmi allowed Babar to call other conspirators in terror plots, using his cellphone. Babar, who was arrested in 2004 and has pleaded guilty to five counts of material support for Al Qaeda, faces up to seventy years in prison. While awaiting sentence, he has agreed to serve as a government witness in terror trials in Britain and Canada, as well as in Hashmi’s trial. For his cooperation, Babar will be rewarded with a reduced sentence. Material-support laws are predicated on guilt by association. They fashion a black box into which all sorts of constitutionally protected activities can be thrown and classified as suspect, if not criminal. Because there is little evidence in this case that links Hashmi directly to any criminal action, much of the government’s case will hinge on establishing his intent. To do this, the government will likely focus on statements Hashmi has made about US foreign policy, the treatment of Muslims here and abroad and other political issues. Hashmi, who was a member of the New York political group Al Muhajiroun as a student at Brooklyn College, advocated positions well outside the mainstream of American public opinion. Indeed, he drew the attention of Time and CNN in May 2002 as a student activist and potential homegrown threat; both quoted him at a 2002 Brooklyn College meeting, calling America “the biggest terrorist in the world.” The government, however, has not designated Al Muhajiroun a terrorist organization or deemed membership in the organization illegal. This prosecution thus has the potential to criminalize constitutionally protected political speech. Hashmi has been in solitary confinement at MCC awaiting trial since May 2007. Since October of that year he has been held under Special Administrative Measures (SAMs) imposed and then renewed by the attorney general. The government’s authority to impose SAMs was established in 1996. Since 9/11, the standards for imposing them–and conditions for their renewal–have been significantly relaxed. Under the SAMs, Hashmi is allowed no contact with anyone–except his lawyer and, more recently, his parents–no calls, no letters, no talking to other prisoners through the walls, because his cell is electronically monitored inside and out. He must shower and go to the bathroom in view of the camera. He can write one letter a week to a single member of his family, but he cannot use more than three pieces of paper. He is forbidden any contact–directly or through his attorneys–with the news media. He can read newspapers but only portions approved by his jailers–and not until thirty days after publication. He is allowed only one hour out of his cell a day–which is periodically withheld–and is not allowed fresh air but is forced to exercise in a solitary cage. The SAMs pose a significant threat to Hashmi’s mental health and his ability to participate fully in his defense. Their severity casts a pall of suspicion over him, in effect depicting him as guilty before he even enters the courtroom. His “proclivity for violence” is cited as the reason for these measures–despite the fact that he has never been charged with (let alone convicted of) committing an act of violence. Anand Gopal: Villagers and human rights officials accuse the United States military of torturing suspects in hidden detention centers. Staying the hand of justice on torture has gained the Obama administration nothing from Republicans. It’s time to investigate deaths at Guantánamo. Rachel Roth: Incarcerated women have achieved a string of victories against inhumane treatment in childbirth. But what about access to healthcare for all pregnant women in prison, not just those in labor? Jeanne Theoharis: Terror suspects are held in US prisons on dubious evidence under inhumane conditions. Moreover, through the Classified Information Procedures Act, enacted in 1981 to prevent graymail by US intelligence officers under prosecution, much of the evidence against Hashmi is classified, which means he will not be allowed to view much of the evidence in his trial. His lawyer went through a CIA-level clearance to be able to review it; however, because of national security claims, Hashmi’s attorney is forbidden from discussing much of the government’s evidence with Hashmi or with any outside experts who do not also have security clearance. The defense asked for a modest set of changes in the conditions of Hashmi’s confinement–that his elderly and disabled parents be allowed to visit him together, that he be allowed to exercise in MCC’s recreational facility on the roof and with other prisoners, to participate in group prayer and to have a cellmate. The judge refused all these requests, siding with the US Attorney’s tautological argument that the original imposition of SAMs dictating higher security measures proved the paramount national security considerations of Hashimi’s case, thus rendering the conditions of his confinement legitimate and necessary. It is not surprising, then, that in cases like Hashmi’s where SAMs have been imposed since 9/11, almost none have been lifted. Judge Preska also claimed that Hashmi’s restrictions are “administrative rather than punitive” and thus constitutional. Hashmi has spent nearly a year and a half under the SAMs in a federal detention center in Manhattan under the sanction of the US District Court for the Southern District of New York. The conditions of his pretrial confinement are not substantially more humane than those of many prisoners in Guantánamo, nor is his right to a fair trial in New York City unequivocally more protected than those of many foreign nationals facing US military commissions in other parts of the world. What, then, do we think will happen if the Guantánamo detainees are transferred and tried in federal courts? The inhumane conditions of Hashmi’s pretrial confinement are not aberrational. Canadian citizen and US legal resident Mohammed Warsame has been held for more than five years in Minneapolis without trial (most of it in solitary confinement under SAMs) despite a speedy-trial motion his lawyers filed more than three years ago. In December 2003 Warsame was secreted away for four days of “voluntary” questioning at a military base in northern Minnesota. Authorities believed he had information on Zacarias Moussaoui, since the two men had attended the same mosque in Minnesota. Held as a material witness, Warsame hardly knew Moussaoui and had no testimony to provide about him, even when brought to his trial. The government then filed material-support charges against Warsame, claiming he had taught English to Taliban nurses, had eaten in the same room with Osama bin Laden and sent $2,000 to people in Afghanistan the government claims were with the Taliban. Civil rights violations are also becoming entrenched in prison policy. In December 2006 the Justice Department quietly set up a segregated facility, the Communication Management Unit, at the federal prison in Terre Haute, Indiana, for medium-security terrorism inmates. Nearly all the inmates transferred to Terre Haute are Muslims. All calls and mail (communication customarily off limits to prison officials) are monitored, and prisoners are required to communicate with each other only in English. The highest-level terrorists are typically sent to the Penitentiary-Administrative Maximum Facility, known as Supermax, in Florence, Colorado. Colorado Governor Bill Ritter is considering opening the prison’s doors to the Guantánamo detainees; the facility, according to Ritter’s spokesman, is “built for just that type of high-risk inmate.” Amnesty International has been critical of conditions at Supermax, where prisoners have almost no opportunity for human interaction, physical exercise or mental stimulation–conditions many of the men faced at Guantánamo and that Hashmi faces in Manhattan. Indeed, one of the United States’ most wanted terror suspects, Khalid al-Fawwaz, is fighting extradition to the United States on the grounds that the conditions in a prison like Supermax in Colorado breach Article Three of Britain’s Human Rights Act, which prohibits torture and other inhuman or degrading treatment or punishment. Of the six people, including Hashmi, being held under pretrial SAMs in the United States, three are under the jurisdiction of the US Attorney for the Southern District of New York. Stationed at ground zero of the political theater of 9/11, this Manhattan office has taken wide latitude in imposing extreme conditions of imprisonment. Before 2001, SAMs were used against high-level prisoners whose power and influence could inspire acts of violence outside prison (like the head of the Latin Kings gang, who ordered a hit from prison). Today, these are imposed more reflexively against suspects the government seeks to mark as dangerous, regardless of their demonstrated actions or influence outside prison. (Indeed, the US Attorney has not publicly claimed that Hashmi has reach outside the prison.) Moreover, the Southern District of New York is a major steppingstone to national office–and prosecuting terrorists has significant political cachet. On the stage of American terror justice, US Attorneys across the country have become the lead actors. Featured prominently on the nightly news, they speak in ominous tones describing the importance of each latest terror indictment–plots foiled, sleeper cells discovered, terrorists nabbed. The public performance of these indictments reminds Americans of the grave dangers the nation faces and the need for special measures to protect us, even as it reassures us that the government is averting danger at every turn. The paucity of evidence in many of these cases and the inhumane treatment of suspects have gone remarkably unchecked by many judges. Such abrogations of rights and due process rarely receive significant media coverage. In Miami, prosecutors are going back to court for the third time, seeking conviction on material-support charges of six men for a plot to blow up the Sears Tower. The nightly news in June 2006 trumpeted the arrest of seven “Muslim” men and the dashing of their plan to attack the Sears Tower as part of a jihad. (By the next day, however, even the FBI described the plan as “aspirational rather than operational.”) The seven men are actually members of the Moorish Science Temple, a religious sect that blends elements of Christianity, Judaism, Islam and black nationalism. The case, lacking any concrete evidence of weapons or blueprints and using questionable informants (the jurors felt that an FBI informant led the men on), has already resulted in two mistrials. Yet the US Attorney has pressed for the third trial in order to “safeguard the community,” even though no new evidence has come to light. Media outlets across the country hyped “sleeper cells” discovered in Detroit in 2002 and Lodi, California, in 2005. Two men in Detroit were convicted in 2003 but had their sentences subsequently suspended (and the US Attorney was indicted) when it was revealed that the US Attorney concealed exculpatory evidence. In Lodi another FBI informant, who was paid $250,000 for his work, appears to have acted as an agent provocateur with father and son Umer and Hamid Hayat. The government succeeded in getting a conviction of the son using the contradictory and misleading confessions of the Hayats–both of whom sought to cooperate with investigators. (The father went so far as to claim that his son trained in a basement, including doing pole-vaulting exercises. When the FBI interviewer commented that the basement ceiling must have been very high, the father concurred.) A longtime FBI agent was going to testify for the Hayats’ defense that this was “the most derelict and juvenile investigation” he had ever seen the FBI put forth, but the court disallowed the testimony. Awakened in the middle of the night, a Maryland doctor is startled to find two men at his front door. One has a broken leg and needs immediate attention. Letting them in, he sets the leg and allows them to stay the night. The following morning, the doctor travels to town, only to learn that the president has been shot. In the hysterical witch hunt that follows, Dr. Samuel Mudd is arrested, convicted, and sentenced to life in prison for conspiring to assassinate Abraham Lincoln. The man whose leg he set was John Wilkes Booth. In a 2005 Newsweek article, Mudd is referred to as a “folk hero who was wronged by the government.” Most historians agree. In the wake of the terrorist attacks of 9/11, a new search began for enemies of the United States. In 2006, Syed “Fahad” Hashmi, a 26-year-old American citizen and Brooklyn College graduate who had earned his masters degree in International Relations at London Metropolitan University only a month earlier, was arrested boarding a plane in London and charged with a number of crimes related to providing “material support” to a terrorist organization. The American warrant for Fahad’s arrest and extradition was based on the testimony of Mohammed Junaid Babar, a one-time classmate who had been recently sentenced to 70 years in prison. Agreeing to cooperate to reduce his own sentence, Babar has implicated at least eight acquaintances from England, Canada, and America – including Fahad Hashmi. Today, Fahad sits in Manhattan’s downtown federal Corrections Center, where for the past two and a half years, he has had to endure 23-hour solitary confinement. The United States Government has never alleged that Fahad is or ever has been a member of al-Qaeda or has ever had any involvement in terrorist operations. Instead, the Government states that Fahad let Junaid stay with him while the latter was en route to Pakistan. The prosecution argues that this act is tantamount to providing “material support” to a terrorist organization because Junaid was carrying rain gear in his luggage to give to an al-Qaeda official. Given the lack of evidence against Fahad, the prosecution plans to buttress its case by establishing alleged “criminal intent” through statements he made criticizing the so-called “War on Terror,” and his membership in a Muslim student group while attending Brooklyn College. Such statements and associations, however, must be constitutionally protected. In fact, a “Statement of Concern” regarding Fahad’s constitutional rights has been signed in his support by more than 500 notable academics, writers, and intellectuals, including Henry Louis Gates Jr., Noam Chomsky, Angela Davis, and Eric Foner. A rapidly growing community of supporters has rallied around his cause, as well, speaking out in the media, in the courtroom, and in vigils outside the federal facility where Fahad continues to be held in isolation. Also problematic, Fahad has been hamstrung in his efforts to build a viable defense. Restrictions have been placed on his lawyer from discussing some of the prosecution’s evidence with Fahad himself because it is “classified.” In addition to the due process concerns, the excessive time for the defense to get security clearance has left Fahad sitting alone in prison, deprived of his freedom for more than 2 ½ years, in a legal Catch 22. Fahad’s trial will commence before Judge Preska on Wednesday, April 28th, at the United States Federal Courthouse for the Southern District of New York. America has often learned too late from past injustices of ‘guilt by association’—be it Samuel Mudd or Ethel and Julius Rosenberg or the victims of McCarthyism. To stand up for justice in our present and for our future, come out to the courthouse on April 28th—and wear orange. Far more than one man’s life is at stake. Regulation should help provide a basis for the industry’s expansion. –Originally subscribed by an alliance of domestic and international Islamic banks as well as the Islamic Development Bank, industry-sponsored AAOIFI has since extended its membership categories to include authorities that regulate and supervise Islamic financial institutions. –It also offers observer member status to conventional financial institutions that operate Islamic ‘windows’ (special facilities offered by conventional banks to provide services to Muslims who wish to engage in Islamic banking). Standards. AAOIFI’s Sharia Standards 2010 contains 41 standards, including 11 new stipulations pertaining to gharar (uncertainty) in financial transactions, arbitration, zakat (alms giving) and online financial transactions among others. Additionally, its Accounting, Auditing and Governance Standards 2010 contains 40 standards covering the areas of accounting, auditing, ethics and the governance of Islamic financial institutions. –The AAOIFI’s standards have been made mandatory for Islamic financial institutions in Bahrain, Dubai International Financial Centre, Jordan, Sudan, Syria and Qatar. –Last month the State Bank of Pakistan announced that it had begun selectively to implement AAOIFI Sharia Standards and has advised Islamic banks to prepare for the phasing in of further standards in the near future. –In other countries, including Indonesia, Lebanon, Malaysia, Saudi Arabia and the United Arab Emirates, AAOIFI standards have been incorporated into national guidelines and are adhered to by AAOIFI member institutions. Standardization issues. The lack of standardization of Islamic financial products has been a major barrier to the cross-border sale of Islamic financial products. The AAOIFI and its sister standard-setting organization, the Kuala Lumpur-based Islamic Financial Services Board (IFSB)–primarily tasked with developing capital adequacy rules for Islamic financial institutions–have become key players in the construction of the emerging international framework that governs Islamic finance. The AAOIFI has over 200 members from 45 countries while the IFSB has 193 members operating in 39 jurisdictions. More intrusive regulation. So far the compliance of member institutions with the standards can neither be enforced nor fully monitored, unless they are mandated at country level and then enforced by domestic regulators. Last month, the AAOIFI announced a timetable for taking a more intrusive approach to regulating Islamic financial products, including plans to create a watchdog committee–composed of sharia scholars and market practitioners–by the second half of 2010. However, increasingly different trajectories of Islamic banking and Islamic capital market development could in turn affect the further standardization of Islamic financial products. –Interpretation of Islamic law. Given the absence of a highest religious authority in majority Sunni Islam, assessing the Sharia quality of Islamic financial products depends on a number of representatives from different legal schools with sometimes widely varying interpretations. –Scarcity of qualified sharia scholars. To address the shortage of scholars well versed in both sharia and finance, a number of programs have sprung up that offer degrees in Islamic finance. Outlook.Overall, the outlook for Islamic finance remains positive. Recent efforts to develop common standards for Islamic financial institutions should help to provide a sound basis for the expansion of the industry. RIYADH — Saudi King Abdullah presented Turkish Prime Minister Recep Tayyip Erdogan with one of the country’s most prestigious prizes on Tuesday for his ‘service to Islam’. Erdogan earned the King Faisal International Prize for having “rendered outstanding service to Islam by defending the causes of the Islamic nation, particularly the Palestinian cause and the just rights of the Palestinian people,” said Abd Allah al-Uthaimin of the prize-awarding group. Seven academic researchers were also awarded King Faisal Prizes. Algerian Abdurrahman Elhaj-Saleh and Lebanese Ramzi Baalbaki jointly earned the King Faisal Language and Literature prize for Arabic linguistic and grammatical research. German Reinhold Ganz and Canadians Jean-Pierre Pelletier and Johanne Martel Pelletier shared the King Faisal Prize for Medicine for work on osteoarthritis. US-based mathematicians Enrico Bombieri and Terence Chi-Shen Tao split the King Faisal Science prize for their work in theoretical mathematics. Winners receive a 200-gram gold medal and 200,000 dollars and co-winners split that sum. 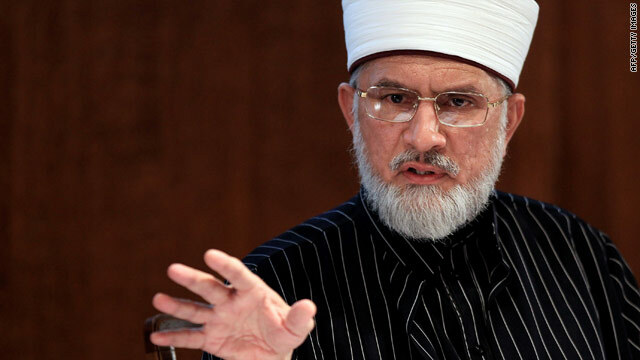 Tahir ul-Qadri, founder of the Minhaj-ul-Quran International, announces his fatwa in London on Tuesday. Islamabad, Pakistan (CNN) — A fatwa, or religious ruling, issued this week is roiling theological waters after it took aim at those notorious for targeting others: terrorists. The anti-terrorism fatwa by renowned Muslim scholar Muhammad Tahir ul-Qadri pulled no punches, declaring that terrorism was “haraam,” or forbidden by the Quran, and that suicide bombers would be rewarded not by 72 virgins in heaven, as many terrorist recruiters promise, but with a suite in hell. “This fatwa has the potential to be a highly significant step towards eradicating Islamist terrorism,” Quilliam, a counter-extremism think tank based in London, said in a statement. “This is a landmark theological study — a careful and systematic treatment of a thousand years of legal tradition dealing with armed resistance against the state, rules of engagement, aspects. The fatwa itself … is categorically and comprehensively against terrorism in any form and for any cause,” Ahmed said. Many skeptics questioned whether an intellectual dismantling of al Qaeda’s religious philosophy could have any impact on recruiting terrorists in places like Pakistan, where many potential foot soldiers don’t have access to education, much less academic discourse. I didn’t leave a single, minor aspect that, in the mind of radicals or extremists, can take them to the direction of martyrdom. In the recent case involving five young Americans from the Virginia area, known as the “D.C. Five,” who are in a Pakistani jail potentially facing terrorism charges, the so-called ringleader Ramy Zamzam allegedly had contact with radical Islamist Web sites. Last week, 24 year-old Afghan-born American Najibullah Zazi pleaded guilty to conspiring to blow up high-density targets in New York City. Prosecutors allege he, too, communicated online with terrorists. Salman Ahmad, the lead singer of the Pakistani rock band “Junoon” and author of “Rock & Roll Jihad: A Muslim Rock Star’s Revolution,” says it’s young men in the West who can be influenced the most by Qadri’s arguments. “The fatwa by the Pakistani Islamic scholar is an important positive religious ruling and it has been made in the West, where a lot of young impressionable Muslim kids are being brainwashed by the terrorists to commit murder and suicide in the name of Islam,” Ahmad said. CAIRO — Egypt will shoulder the costs of restoring the country’s Jewish houses of worship said the culture minister Tuesday, two days after a historic synagogue in Cairo’s ancient Jewish quarter was rededicated in a private ceremony. Farouk Hosny said in a statement that his ministry views Jewish sites as much a part of Egypt’s culture as Muslim mosques or Coptic churches and the restorations would not require any foreign funding. On Sunday, the Ben Maimon synagogue, named after the 12th century rabbi and intellectual Maimonides, was rededicated in a ceremony that included half a dozen Egyptian Jewish families that long ago fled the country. Hosny committed his ministry to restoring all 11 synagogues across Egypt, three of which have already been renovated. The best-known synagogue that of Ben Ezra, is located in Cairo’s Christian quarter near a number of old churches and was restored years ago. The ceremony at the Ben Maimon synagogue was closed to media but attendees said it was an emotional event, especially for the Egyptian-Jewish families invited, many of whom now live in Europe. “There were some lectures on the Jewish sites in Egypt and the temple. It was nice, emotional and nostalgic,” said Raymond Stock, an American close to the Jewish community in Cairo who attended the three-day event. A group of about 11 Hassidic Chabad-Lubavitch rabbis also came to Cairo from the United States and Israel and sang at the event. Egypt’s Jewish community, which dates back millennia and at its peak in the 1940s numbered around 80,000, is down to several dozen, almost all of them elderly. The rest were driven out decades ago by mob violence and persecution tied in large part to the Arab-Israeli conflict. Egypt and Israel fought a war every decade from the 1940s to the 1970s until the 1979 peace treaty was signed. Despite that treaty, Egyptian sentiment remains deeply unfriendly to Israel, and anti-Semitic stereotypes still occasionally appear in the Egyptian media. Last September, Hosny blamed a conspiracy “cooked up in New York” by the world’s Jews when he lost a bid from becoming the next head of the U.N.’s agency for culture and education. At the time, Hosny’s candidacy raised an outcry because of a threat he made in the Egyptian parliament in 2008 to personally burn any Israeli book he found in the Alexandria Library. While he later apologized and Israel said it had withdrawn its opposition to his candidacy, several prominent Jewish activists spoke out against him in the run-up to the vote. The crime of apartheid” includes murder, extermination, enslavement, torture, arbitrary arrest, illegal imprisonment, denial of the right to life and liberty, cruel, inhuman and degrading treatment, and other abusive acts imposed by one group on another. As implemented, Zionism’s essence is “a sophisticated legal, social, economic and political regime of racial discrimination that has led to colonialism and apartheid as well as the dispossession and displacement of the Palestinian people.” Colonialism flourishes by separating indigenous people from their land and heritage. Vancouver, Waterloo (Canada), and Winnipeg. and social, political and economic justice. promised,” in contrast to the OPT where there’s none. Palestine solidarity calendar, according to its organizers. Ottawa, London and Washington be far behind? perpetrators should be held criminally liable. ADL, of course, calling this hateful. Submitted by admin3 on 4 March 2010 – 10:43am. Ahmedabad: The Gujarat High Court here was petitioned Wednesday to transfer the 2002 Gulbarg Society massacre case, which left 69 people dead during the Gujarat riots, the affected families alleging a bias on the part of the special judge. The petition by witnesses and riot victims comes after their plea filed before the principal sessions judge G.B. Shah for the transfer was dismissed on the premise that the special court was appointed by the Gujarat High Court. The petitioners contend that the behaviour of special judge B.U Joshi during trial had led to erosion of faith in him and in the circumstances the case should be transferred to some other court. They allege that after two witnesses — Imtiyaz Khan Pathan and Rupa Dara Modi — deposed, the judge disallowed further witnesses from stepping out of the witness box to identify the accused at the back of the courtroom, and overruled the objections raised by the witnesses through their advocates. The special court was set up by the Gujarat High Court under directions of the Supreme Court for the trial of nine serious incidents of killings during the 2002 communal riots. The 69 people who died in the Gulbarg Society massacre also included former Congress MP Ehsaan Jaffri. The petition in the high court also comes a day after the special public prosecutor R.K. Shah and assistant public prosecutor Naina Bhatt sent in their resignations from the case to the Supreme Court appointed Special Investigation Team (SIT) probing it. of Arabic and other languages of countries where Islam holds sway. decided to delay his wedding, hoping to get married as a police officer. disapproved of people from “other countries” joining the department. spokesman, declined to specifically address the statements that Mr.
and that he had engaged in “tax evasion” from 2001 to 2005.
hailed him from the sidewalk, was dismissed when he went to court. Officer Ramkissoon did not respond to a request for comment. March 1, 2010, on page A24 of the New York edition. Karadzic, who has earned notoriety as ‘the butcher of the Bosnia,’ is charged with 11 counts of genocide and war crimes. Karadzic, who has earned notoriety as 'the butcher of the Bosnia,' is charged with 11 counts of genocide and war crimes. One of many Srebrenica mass graves, where the victims were shot to death, including children aged between 7 and 11. The trial of the Bosnian Serb wartime leader Radovan Karadzic is set to resume before a UN court after a four-month-long suspension. The hearings, which started in October 2009, have been adjourned since early November after the tribunal appointed a lawyer to represent Karadzic. The infamous ex-leader has been conducting his own defense and has boycotted the trials once, claiming he needed more time to prepare. Karadzic, who insists he’s innocent, is expected to outline his defense at the International Criminal Tribunal in The Hague on Monday. The session will see its first witness on Wednesday. Karadzic, known as the ‘Butcher of Bosnia’, is charged with 11 counts of genocide, war crimes and crimes against humanity during the 1992-95 Bosnian war. They include the massacre of more than 7,000 Muslim men and boys at the UN-protected enclave of Srebrenica in July 1995. The supreme commander of an ethnic cleansing campaign is also charged with responsibility for the 44-month siege of Sarajevo, which ended in November 1995 after some 10,000 people, many of them civilians, had been killed. Karadzic was arrested in Belgrade in July 2008 after nearly 13 years on the run. During his time in power, he was president of the self-styled Bosnian Serb Republic and commander of its army during the Bosnian conflict, which claimed about 100,000 lives, mostly Muslim and caused the displacement of 2.2 million people. WE may scoff at the idea that the Olympic Games have anything to do with the “endeavor to place sport at the service of humanity and thereby to promote peace,” as the Olympic charter enshrines as its ideal. But at least nations across the world were able to put aside differences for two weeks of friendly competition in Vancouver. It’s a small but telling controversy. It puts the lie to the idea of the Islamic world as a bloc united by religious values that are hostile to the West. It also gives clues as to how the United States and its allies should handle two of their most urgent foreign policy matters: the Iranian nuclear program and the Israeli-Palestinian conflict. This is not the first time that Arabs have challenged the internationally accepted name of the waterway that separates Persia (or Iran, as it has been called since 1935) from the Arabian Peninsula. Pan-Arabist thought — which dominated Arab political life for most of the 20th century — insisted on the creation of a unified vast empire “from the Atlantic Ocean to the Arab Gulf,” provoking sharp confrontations with Iran since the late 1960s. Yet like Stalin, who responded to the Nazi invasion of the Soviet Union in 1941 by urging his people to fight for the motherland rather than for the Communist ideals with which they had been indoctrinated, Khomeini reverted to nationalist rhetoric to rally his subjects after the Iraqi invasion of 1980. He also used the war to justify a string of military and diplomatic actions against the smaller Arab states like Qatar and Kuwait aimed at asserting Iran’s supremacy in the gulf. It took a mere 24 years after the Prophet’s death for the head of the universal Islamic community, the caliph Uthman, to be murdered by political rivals. This opened the floodgates to incessant infighting within the House of Islam, which has never ceased. Likewise, there has been no overarching Islamic solidarity transcending the multitude of parochial loyalties — to one’s clan, tribe, village, family or nation. Thus, for example, not only do Arabs consider themselves superior to all other Muslims, but inhabitants of Hijaz, the northwestern part of the Arabian Peninsula and Islam’s birthplace, regard themselves the only true Arabs, and tend to be highly disparaging of all other Arabic-speaking communities. Nor, for that matter, has the House of Islam ever formed a unified front vis-à-vis the House of War (as Muslims call the rest of the world). Even during the Crusades, the supposed height of the “clash of civilizations,” Christian and Muslim rulers freely collaborated across the religious divide, often finding themselves aligned with members of the rival religion against their co-religionists. While the legendary Saladin himself was busy eradicating the Latin Kingdom of Jerusalem, for example, he was closely aligned with the Byzantine Empire, the foremost representative of Christendom’s claim to universalism. This pattern of pragmatic cooperation reached its peak during the 19th century, when the Ottoman Empire relied on Western economic and military support to survive. (The Charge of the Light Brigade of 1854 was, at its heart, part of a French-British effort to keep the Ottomans from falling under Russian hegemony.) It has also become a central feature of 20th- and 21st-century Middle Eastern politics. Muslim and Arab rulers have always, in their intrigues, sought the support and protection of the “infidel” powers they so vilify. President Gamal Abdel Nasser of Egypt, the champion of pan-Arabism who had built his reputation on standing up to “Western imperialism,” imported more than 10,000 Soviet troops into Egypt when his “War of Attrition” against Israel in the late 1960s went sour. Similarly, Ayatollah Khomeini bought weapons from even the “Great Satan,” the United States. Saddam Hussein used Western support to survive his war against Iran in the 1980s. And Osama bin Laden and the rest of the Afghan mujahedeen accepted weapons and money from the United States, with the Islamic state of Pakistan as the middleman, in their struggle against the Soviet occupation. Beyond the customary lip service about Western imperialism and “Crusaderism,” most other Muslim countries would be quietly relieved to see the extremist regime checked. It’s worth noting that the two dominant Arab states, Egypt and Saudi Arabia, have been at the forefront of recent international efforts to contain Iran’s nuclear ambitions. Likewise, there is no way for the Obama administration to resolve the 100-year war between Arabs and Jews unless all sides are convinced that peace is in each of their best interests. Any agreement between Israel and the Palestinians is far less important than a regional agreement in which every Islamic nation can make peace with the idea of Jewish statehood in the House of Islam. And that, depressingly, is going to be a lot harder to pull off than even the Islamic Solidarity Games.